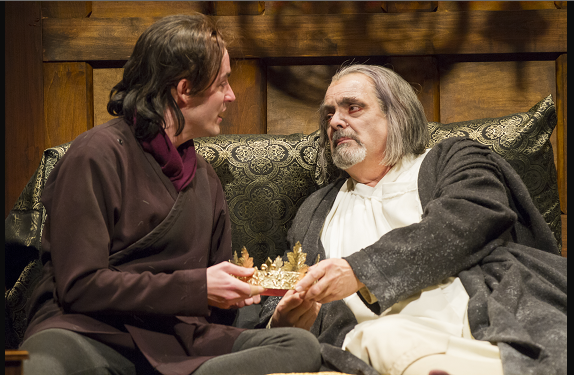 Matthew Amendt as Prince Hal and Edward Gero as King Henry IV production of Henry IV, Part 2. Photo by Scott Suchman. Right after the gloom and doom set up in Act 1 when we learn that King Henry IV is the target of Wales’ and Scotland’s revenge for his crime of treason, the play begins to open up to comedic relief when Falstaff and Henry’s son, Hal, enter together. And that’s a good thing because, notwithstanding the haunting opening set design by Alexander Dodge in which a giant silhouetted map of the territories is displayed, the play gets off to a complicated enough start with a blast of lightening quick repartee between the King, John of Lancaster and the Earl of Westmoreland. It’s enough to rock any unprepared playgoer back on their heels who might not know the lay of the land, so to speak. And remember, it’s all about the land, the King’s tormented conscience for stealing Mortimer’s rightful throne and his crusade to make things right, that goes horribly wrong. “Uneasy lies the head that wears a crown.” Even Prince Hal has that figured out. 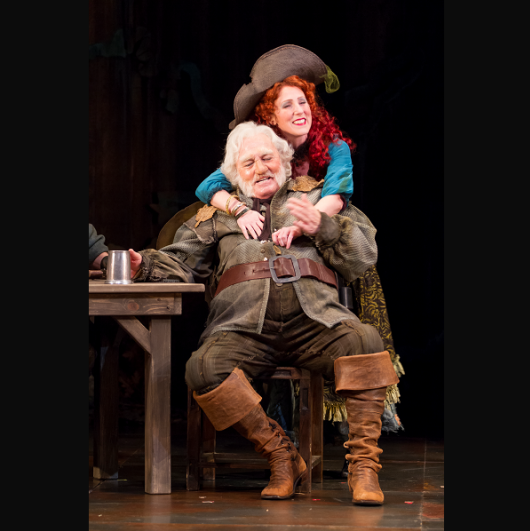 Stacy Keach returns to the Shakespeare Theatre Company as the grandiloquent Falstaff, cohort and amigo-in-arms to the King’s son, Henry the Prince of Wales aka Hal and/or Harry. Falstaff, one of the most enduring and sympathetic characters in all of Shakespeare, is as lovable a scallywag and epitome of a crusty ne’er-do-well as has ever existed in theatredom. And Keach plays him to the hilt, embracing every line, morphing into the character, and flat out owning the role. The man is marvelous. (In one irreverent scene at Henry’s London apartment, he finds a pair of ladies underwear in Hal’s bed and uses them to dab his lips after a meal. You get the picture.) Alas, poor Falstaff, ever the underdog, is repeatedly called every colorful name in describing his ungainly figure, “That huge bombard of sack, that stuffed cloak-bag of guts, that roasted Manningtree ox,” Hal affectionately calls him. Stacy Keach as Falstaff and Maggie Kettering as Doll Tearsheet – production of Henry IV, Part 2. Photo by Scott Suchman. There is much to praise about Shakespeare Theatre Company’s engaging two-night presentation, the exquisite costumes of silk, fur, leather and chainmail by Ann Hould-Ward, the sword fighting direction by Rick Sordelet and Christian Kelly-Sordelet, original period-inspired music composed by Michael Roth, including a tender Welsh ballad sung by Lady Mortimer (Vanessa Sterling), and especially the remarkably magnetic Matthew Arendt who plays Prince Hal. Arendt brims with irresistible charm keeping the energy level, as well as the cast, in high gear. 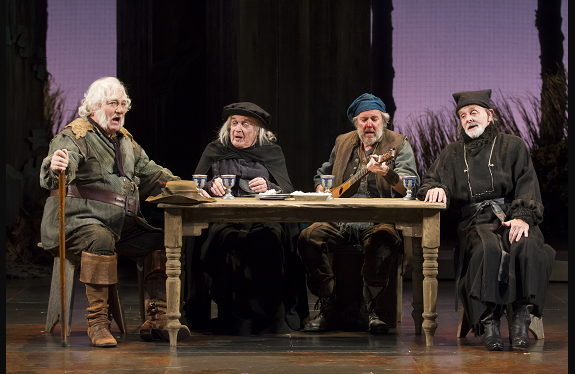 Stacy Keach as Falstaff, Ted van Griethuysen as Justice Shallow, Brad Bellamy as Bardolph, and Bev Appleton as Justice Silence in production of Henry IV, Part 2. Photo by Scott Suchman. Other standouts are Craig Wallace, who gives an elegant portrait of the swaggering Earl of Westmoreland, John Keabler as the sexiest Hotspur alive, Kelley Curran as his wife, Lady Percy, as alluring a liberated woman as ever there was, and of course, Edward Gero in the powerhouse role of Henry IV. Look for scene-stealer Ted van Griethuysen who simply kills it as Justice Shallow in Part 2. Through June 8th at Sidney Harmon Hall, 610 F Street NW, Washington, DC 20003. For tickets and information contact the Box Office at 202 547-1122 or visit www.shakespearetheatre.org. 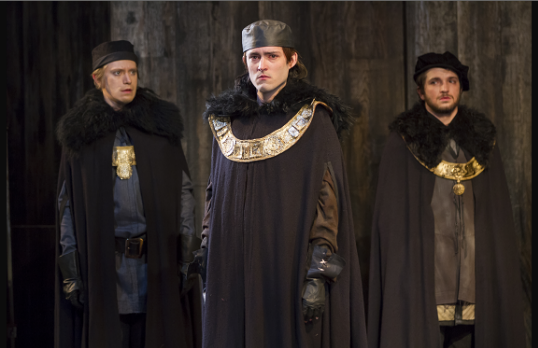 Matthew Amendt as Prince Hal, Patrick Vaill as Lancaster, and Nathan Winkelstein as Gloucester in production of Henry IV, Part 2. Photo by Scott Suchman.